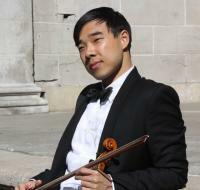 Phong is our concertmaster, and joined us in December of 2009. He probably doesn’t know it (since we weren’t friends at the time), but QUOboist Brian Shaw is my link to QUO. A mutual friend saw Brian’s Facebook post about the very first concert and passed along the info. That very night I was a member of the first QUO audience. One month later I was at the GMHC sitting in on the first rehearsal of 2010, and I haven’t been kicked out yet! I still remember that my very first QUO rehearsal included only 3 other violinists. It’s amazing to now come to rehearsal and see more than quintuple that number of violin colleagues. What instrument do you play, and how long have you been playing it? I play the violin, and my first exposure to the instrument was at age 8. All the third graders received an orientation to stringed instruments one afternoon, and I remember there was a poster of a knight holding a violin. I thought he looked cool, so I begged my parents to sign me up for lessons. Nothing beats a trip down to Chinatown for Dim Sum. I love taking my friends to Jing Fong on Elizabeth Street where people are amazed that a restaurant that seats over 1,000 people can get hot food on your table within seconds of sitting down. Their Zhaliang (fried doughnut wrapped in rice noodle) is the best. My friends who know me the best would probably agree that dolce suits me the best, and it’s mostly because they know I have a huge sweet tooth. Pass the Gummi Bears. Question from Erin: Besides the orchestra, what other non-work activities do you do? I love spending time with my husband (probably because we are still newly married, ha!). When we aren’t taking advantage of New York’s thriving performing arts scene, we’re probably trying to book our next travel destination. We speak six languages between the two of us, and it’s fun to try to use them all!